1 What Is Epidermolysis Bullosa? 3 Who Gets Epidermolysis Bullosa? 4 What Causes Epidermolysis Bullosa? 5 How Is Epidermolysis Bullosa Diagnosed? 6 What Are the Symptoms of Epidermolysis Bullosa? 7 How Is Epidemolysis Bullosa Treated? 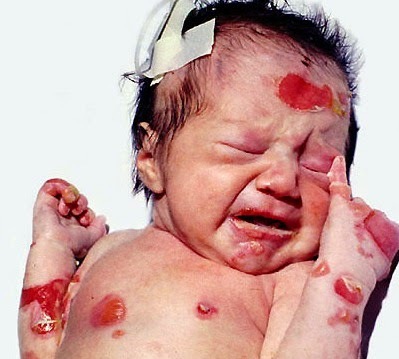 Epidermolysis Bullosa (EB) is an illness that causes the skin to be fragile. 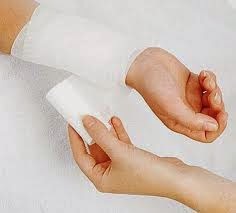 Because the skin is so fragile, it can be easily injured, causing painful blisters to form. These blisters can cause serious problems if they become infected. Some people with EB have a mild form of the disease with few blisters. For others, there may be many blisters on the skin. Some people develop blisters inside the body in places such as the mouth, stomach, esophagus (the tube that allows food to move between the throat and stomach), bladder, and elsewhere. Most types of epidermolysis bullosa initially affect infants and young children, although some people with mild forms of the condition don’t develop signs and symptoms until adolescence or early adulthood. Mild forms of epidermolysis bullosa may improve with age, but severe forms may cause serious complications and can be fatal. There’s currently no cure for epidermolysis bullosa. For now, treatment focuses on addressing the symptoms, including pain prevention, wound prevention, infection and severe itching that occurs with continuous wound healing. The primary indication of epidermolysis bullosa is the eruption of fluid-filled blisters (bullae) on the skin, most commonly on the hands and feet in response to friction. 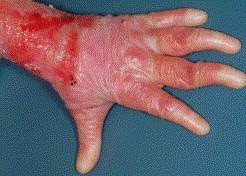 Blisters of epidermolysis bullosa typically develop in various areas, depending on the type. In mild cases, blisters heal without scarring. Anyone can have EB. Generally, the symptoms first appear in babies or toddlers. Most cases of EB are hereditary (runs in families). How Is Epidermolysis Bullosa Diagnosed? A doctor can identify EB by taking a small sample of skin and looking at it under a microscope. Skin blisters are the major symptom of EB. How Is Epidemolysis Bullosa Treated? If you, your child, or another relative has EB, coping with the symptoms can be difficult. You do not have to handle EB alone. There are doctors, nurses, social workers, clergy members, psychologists, dietitians (people who study food and nutrition), and patient and parent support groups that can help. A special wound covering (for sores that don’t heal).